Importance. -- The preferred hosts of elm spanworm are red and white oaks and a few other hardwood species, especially hickory, pecan, and related trees. This is a destructive forest pest, particularly in the southern Appalachians, where widespread, severe outbreaks have occured. Repeated defoliation can cause growth loss, dieback, reduction in mastcrops, and even mortality. Identifying the Insect. -- Larvae are slate gray to brownish black, with yellowish body markings (yellow or green at low population densities), and l I/2 to 2 inches (40 to 50 mm) long. The adults are snowwhite moths. The small, barrel-shaped, olive-green eggs are laid in masses on the underside of small branches in the Southeast. To the north, they are found more commonly on the bole. Feeding damage on leaves. (Click for detail. JPG 43K). Identifying the Injury. -- Young larvae feed on the edge and undersides of leaves, causing a shothole appearance at low population levels. When populations are high, they consume the entire leaf, except the main veins, giving a feathered appearance to the tree. 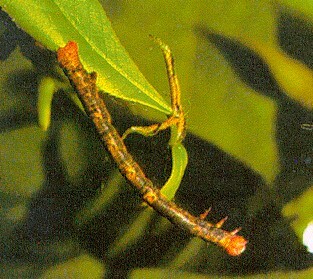 Feeding damage on leaves. (Click for detail. JPG 38K). Biology. -- Overwintering eggs hatch in early spring when the buds break, usually in late April in the South. The larvae feed for 4 to 6 weeks and then pupate in net-like cocoons on the host tree or understory. Six to 10 days later, in late June or mid-July, the moths emerge and deposit their eggs. There is one generation per year. Control. 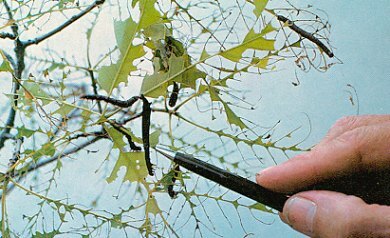 -- Insect parasites attack the eggs of the elm spanworm. Other natural enemies are also important in keeping infestations in check. Chemical controls may be needed to protect high value trees.